Comment: No dust jacket. Book Ships From Los Angeles, USA. Please up to 21 days for delivery. Very Clean Copy. Over 300,000 Amazon Orders Shipped....Buy With Confidence! Orders may be subject to taxes/duties which are determined by country upon arrival. 5.0 out of 5 starsA book to keep you awake at night! We reviewed this book in our Summer e-newsletter. I never knew Australia had so many ghosts! But since it be-gan as a dumping ground for British prisoners, it isn’t surprising. Haunted Australia is a thoroughly enjoyable hard-cover book that includes many moody and spooky color photographs, a few “bloody” splotches, and stories of ghosts and hauntings. When I began reading Haunted Australia, I felt that there were too many quick stories of hauntings without much detail. I then realized that there were so many ghosts that there’s no need for a lot of the extraneous detail other authors use to “fluff” up a book when the “bare bones” (excuse the pun) would suffice. In order to fit in all the haunted spots, Montgomery kept to the facts. That’s not to say there is no detail at all. Montgomery includes quite a bit of history of Australia and each of the allegedly haunted sites to give us a better idea of why a site might be haunted. For example, the Fremantle Arts Centre was formerly a prison, “lunatic asylum”, homeless women’s shelter, midwifery school and HQ for American armed forces in WWII. That could explain experiences such as “cold spots, voices, banging noises, movement of objects, footsteps, smells, physical contact, black shadows, and, terrifyingly, part or full apparitions.” Lots of possible origins for the ghosts. A self-described skeptic, Montgomery explains “I simply presented the stories as I have heard or read them.” Experiences come from various ghost tours, ghost hunting teams, TV teams filming at a site, and individual accounts. Montgomery describes his own experience at a site on Tasmania. Readers are free to visit the public sites to experience the phenomena themselves. Please respect private locales. He also notes that ghosts occasionally show up at different—and widely divergent—places, most of which are not the site of the death. One example is the ghost of David Burnie, imprisoned for “The Moorhouse Murders”. Burnie committed suicide at Casuarina Prison in 2005, and his ghost has been seen there as well as Old Fremantle Prison (or Fremantle Gaol), where he was previously imprisoned. Another is Point Cook, which was the Royal Australian Air Force base until 1925. It is considered the Air Force’s most haunted base, and the ghosts that haunt the base grounds and hangars did not die there. In both cases, Montgomery wonders if the spirits “find their way back to a place even though their earthly bodies may have died elsewhere”. Montgomery also postulates whether “ghosts are more than just the souls of the tormented dead” or if “they are something much more substantial and even less understandable”. Alas, we’ll have to wait for answers to these questions, as Montgomery—and undoubtedly others—are considering the same questions. 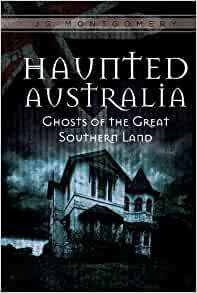 Haunted Australia is chock-full of stories of hauntings from “The Land Down Under”. J.G. Montgomery covers over 150 locations, but there are obviously a lot more to be explored. If you like “spooky stories”, you can’t do better than this chiller/thriller. You might want to read during daylight hours, because some of the stories will keep you up at night.